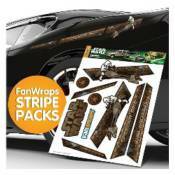 Star Wars Biker Scout Speeder Bike FanWraps Car Decal: Take your vehicle from average to fantastic with FanWraps! The Star Wars Biker Scout Speeder Bike FanWraps Car Decal is perfect for you! The slick stripes feature stickers of a Scout Trooper on a Speeder Bike, symbols for the Galactic Empire, the words, "Speeder Bike," and the Star Wars logo! These great decals will express your fandom, improve your self-confidence and possibly even help you conquer the native population of Endor. Show them your stripes! Ages 15 and up.